A recent study published in BJOG claims second trimester hyperemesis gravidarum may be associated with pregnancy complications involving the placenta. While evidence backs study author claims, the editor of BJOG is not sold on the importance of the study. Hyperemesis gravidarum affects an extremely small portion of the pregnant population and adverse side effects were only noted in the second trimester. Women experiencing severe morning sickness in the first trimester should not worry about possible long-term complications. Hyperemesis gravidarum is a form of pregnancy sickness similar to typical morning sickness. Symptoms are stronger and the condition may lead to dehydration and hospitalization in the severest cases. Less than 3% of pregnant women suffer from the condition and even fewer feel symptoms into the second trimester. According to study authors, hyperemesis gravidarum is caused by elevated human chorionic gonadotropin levels during pregnancy. Data for the study was pulled from the Swedish Medical Birth Register, which collected information from 1997 to 2009. Women who were admitted to the hospital for hyperemesis gravidarum were followed through birth. Placental disorders and other pregnancy and birth complications were noted. Hospitalizations were split into two groups – prior to 12 weeks gestation and between 12 and 22 weeks gestation. Patients were tracked for placental abruption, stillbirth, preeclampsia and small for gestational age infants. About 1% or 12,000 out of 1.1 million women suffered hyperemesis gravidarum. First trimester hyperemesis gravidarum was associated with a slightly higher risk of preeclampsia, but no other complications. 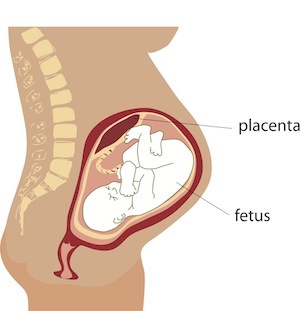 If the condition continued into the second trimester, risk for preeclampsia, placental abruption and small for gestational age infants rose dramatically. Stillbirth risk did not appear to be affected by the condition. Source: M Bolin, H Akerud, S Cnattingius, O Stephansson, AK Wikstrom. Hyperemesis gravidarum and risks of placental dysfunction disorders: a population-based cohort study. 30 JAN 2013 DOI: 10.1111/1471-0528.12132.